There will be no class next week on Thursday (11/27/14) or Friday (11/28/14) do to the Thanksgiving holiday. Classes will resume their usual schedule the following week. We hope you all have an amazing holiday and we look forward to seeing you in class again after Thanksgiving. Congratulations to Our New Purple Sash! 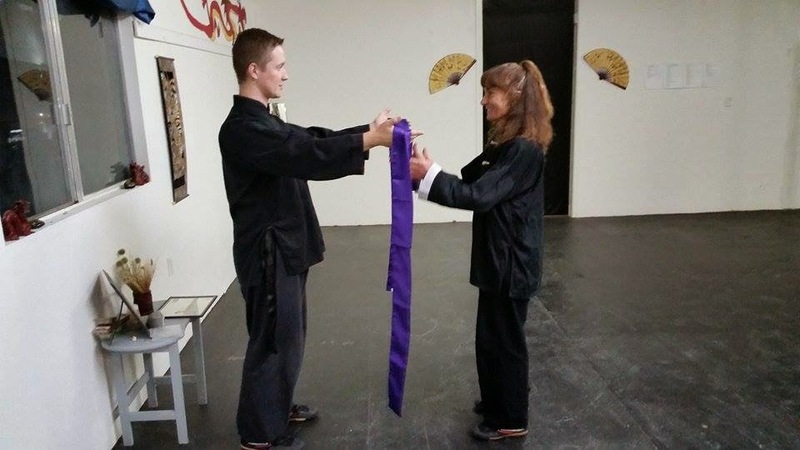 On November 8, 2014 Kathy spent 5.5 hours testing for her first intermediate sash. She worked so hard and earned every bit of her new rank. Congratulations, Kathy! I have had some students request a video of the warm-up we do in class so they can use it at home to warm up before training. It took me a little while to get around to it, but I've finally finished it and I hope you all find it very helpful. Enjoy. After several weeks of working on this series it is finally finished and available for everyone to enjoy. As with the other video series we have posted, the first several videos in this series walk you through each stationary and moving posture of Pan Gen Qigong. The last 6 videos are follow-along videos that contain no instruction and are simply meant to make it easier for you to schedule a video into your day, to make practicing easy to time and accomplish. Pan Gen Qigong (roughly translated as "Turning Foundation" Qigong) is for developing internal power and a strong root for internal martial arts training (such as Tai Chi). However, the benefits of developing internal power and a strong root extend beyond martial arts training into everyday life. It is believed in traditional Chinese medicine that ailments are a direct result of imbalanced energy flow through the body. Because this Qigong set places a great deal of importance on developing your internal energy and circulating it through your body, and the postures aid in directing the energy to break up blockages, this Qigong set can easily be used for health purposes, as well as martial purposes. For the internal martial artists, the stationary postures aid in developing your root while stationary and the moving postures help you maintain that root while walking in a particular pattern. I hope you all find this series and this Qigong set useful and I hope you enjoy practicing it as much as I do. Enjoy! This is just a quick heads up for those students who missed the announcement in class. 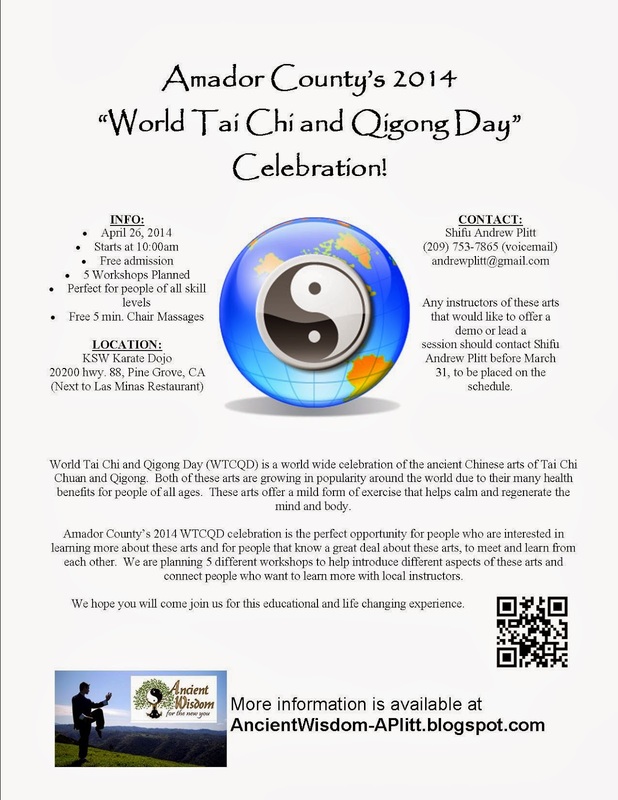 There will be no evening Tai Chi class on Friday July 4, 2014 nor on Monday July 7th, 2014. Classes will resume as usual on Wednesday July 9th. Have a great time on your 4th of July weekend and be safe! We'll see you in class on Wednesday. Here is the latest video series we have put together. 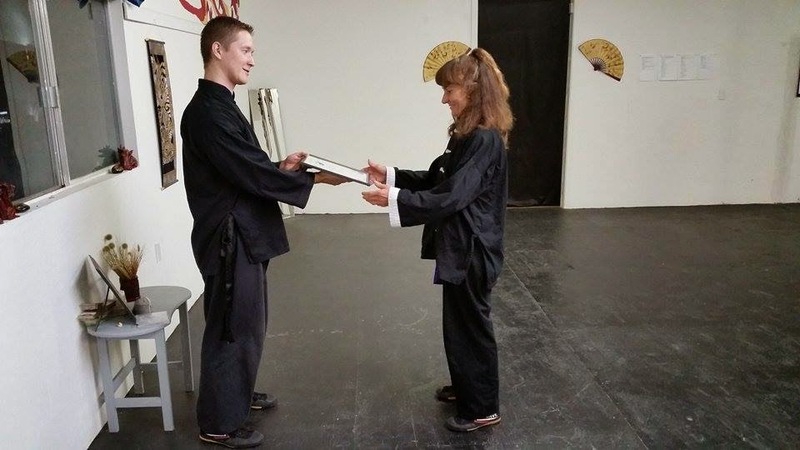 It covers all of the Stepping Sets that our students are required to know for their 2nd level yellow sash. These sets are also very popular exercises among students who are looking to improve their balance and coordination. Enjoy! Video 1 of 11 "Intro"
Video 2 of 11 "Parting the Horse's Mane"
Video 3 of 11 "Wave Hands Like Clouds"
Video 4 of 11 "Diagonal Flying"
Video 5 of 11 "Brush Knee and Push"
Video 6 of 11 "Rooster Stands on One Leg"
Video 7 of 11 "Circle Fists and Twist Step"
Video 8 of 11 "Kick with Heels, Push with Palms"
Video 9 of 11 "Snake Creeps Down"
Video 10 of 11 "Repulse the Monkey"
Video 11 of 11 "Maiden Weaves with the Shuttle"
This Friday (5-23-14) there will be no evening Tai Chi class since Shifu Plitt will be out of town, but classes will resume as usual on Monday (5-26-14). During the months of June and July we will be offering morning Tai Chi classes at the KSW karate dojo in Pine Grove. Classes will be Monday and Wednesday mornings from 9:00 to 10:00am. Please contact Shifu Plitt with any questions. If you have been following our drawing for a jar of Pure Gardens Skin Cream on facebook, you are already aware that there are only 2 days left to enter for a chance to win. For those who are not following this drawing, or missed our last post about it, we want to let you know that there are still 2 days left to enter. You can enter by visiting our facebook page and following the directions in our post from March 3, 2014. Or by using the following embedded facebook post. Post by Ancient Wisdom for The New You. 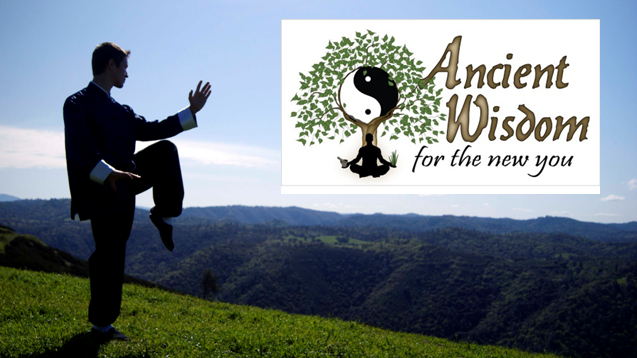 As of today the Sunday evening Qigong classes in Sutter Creek are on hold until June 2014. Scheduling conflicts that cannot be remedied until June have made it necessary to cancel this class until then. We want to thank everyone who came to these classes and enjoyed the many wonderful benefits of Qigong with us and we would like to remind you all that Tai Chi and Qigong classes are held three days a week at the KSW Karate Dojo in Pine Grove and you are all always welcome to join us for these classes. However, if we do not see you again until June, we wish you all the very best in your Qigong practice til then. For a current class schedule please visit out Classes page. I just want to let you all know that there will be no class on Wednesday, March 19, 2014 because I will be out of town. Class will resume as usual on Friday, March 21, 2014 at 6:00pm. Thank you for all of your hard work and perseverance in your training. I hope you all enjoy your day off and I look forward to seeing you on Friday! During the month of march we have decided to run a product giveaway, via our facebook page, for a free jar of Pure Gardens Skin Serum. 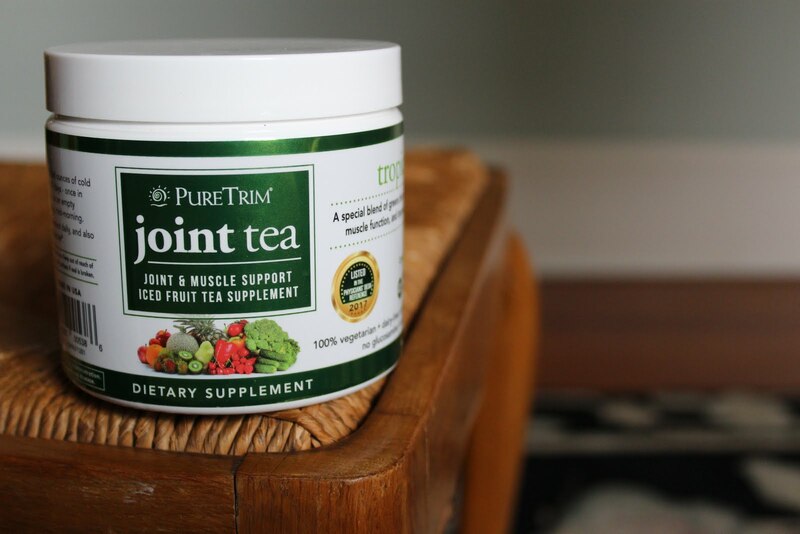 This is an all-natural skin cream that your skin will fall in love with instantly. Here is a short video clip about some of the health benefits of practicing Tai Chi. It's short, but fascinating. Enjoy!